Dental implants have quickly become the standard in tooth replacement. Unlike more traditional tooth replacement options, dental implants restore the entire lost tooth roots and all rather than just the visible portions of smiles. The implant is a durable metal post (usually titanium) placed below the gum line that mimics the function of tooth roots. While this is not the right solution for every patient, the advantages of dental implants compared with traditional tooth replacement options make it a popular option. Contact Forest Hills dentist, Robert Miller, DMD to schedule a dental implant consultation or find out more today. There are two phases to dental implant tooth replacement. The first is the surgical placement of dental implant posts below the gum line. The surgical procedure varies in length and invasiveness based on the number and position of implants to be placed, but the same basic technique is required. A small hole is made in the gums and the implant post is guided into the soft tissue in the ideal position to provide support for a dental prosthetic. Following implant placement, patients will need a period between one and six months during which time the implant post will fuse with the supportive alveolar bone and gum tissue in imitation of a dental root system. Once this process, known as osseointegration, is completed, patients return to our office for restoration. Those missing one to four teeth in a row will receive either a single tooth dental crown restoration or an implant supported bridge. Like their traditional counterparts, implant supported crowns and bridges are custom crafted replacement teeth that fill a gap in patients’ smiles. Unlike traditional crown and bridge, a dental implant post anchors the restoration rather than healthy dental structure. In some cases, patients do not have adequate gum tissue volume or jaw bone density to support a full dental implant. In the past, these patients have needed extensive bone or soft tissue grafts to be able to receive implant supported tooth replacement. Mini implants make it possible for these patients to support even a full denture with dental implants without extensive surgical treatments. Mini implants are also an ideal solution for those patients who are more likely to experience complications related to surgery. Overall, the procedure is very similar to that of traditional dental implants, but in many cases, patients are able to receive a restoration immediately no need to wait several months to attach a prosthetic. Additionally, the amount of time it takes for gum tissue to heal and the post to fuse with natural oral structures is significantly reduced when using mini dental implants. As the name suggest, All-on-4 implants support an entire set of replacement teeth on just 4 dental implant posts. This procedure is unique because it relies on the angle and positioning of the implants rather than sheer quantity of implant posts to create stable support. All-on-4 utilizes the naturally denser jawbone in the front of the bite to anchor an entire denture. Two longer implant posts are anchored to front part of the jaw, but they are angled backward offering support for the back portion of the denture. Because there are fewer implantation sites, it takes a shorter period of time for patients to heal following treatment. In most instances, the implant posts are placed and restored in a single visit. If you’ve previously been unable to receive dental implants due to health concerns or lack of jawbone density, All-on-4 may be a great alternative. 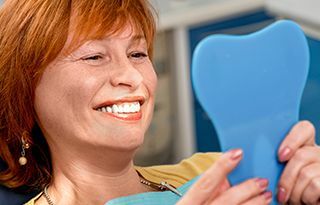 While modern dental prosthetics (replacement teeth) are more comfortable than ever, but still, some denture wearers experience discomfort, looseness, or slipping dentures. If you'd like to eliminate daily denture care and the need for adhesive; if you want dependable teeth that function, look, and feel like nature intended, consider implant-retained dentures. Dr. Miller places dental implants to solve many of the problems associated with dentures and to improve existing satisfactory dentures. Progress in the techniques of implantology, particularly in biomaterials and biomechanics, has taken dental prosthetics to new heights. Implants consist of a replacement tooth root and crown – or denture. About four of the replacement roots, or posts, can securely hold a denture in place. Your current denture may be retrofitted with implant snaps, or Dr. Miller might recommend a new denture specifically designed to accommodate implant stabilization. Dental implant patients experience renewed quality of life, expanded meal choices, and increased self-confidence. To learn more about dental implants and implant-retained dentures, schedule your consultation with Dr. Miller today.